I’ve always been a bit of a rebel. In high school everyone else was listening to Journey and VanHalen, you can be sure I was more interested in Styx or Boston. If all the popular kids were wearing Perry Ellis and Guess clothing, I was in Levi’s. It has always been my nature to look at what the crowd was doing and do something different because in the crowd is where average lives and I’ve never been what you would call average. It’s no surprise then when it came time to educate my children, normal public schooling wasn’t going to make the grade. (get it? Make the grade? never mind… ) Even within homeschooling I’m not interested in following the hot trends and buying the popular curriculum. A mentor once said if you do what everyone else is doing, you’ll end up where everyone else is going. Average homeschoolers change curriculum at least once every school year and often even more. Why? Is there really that much lousy curriculum out there that we have to try dozens to finally find one that is right for our family? Not at all. There are literally hundreds of really good options, something to fit everyone’s needs. The problem is we don’t trust our instincts. We really do know what they need because we know our children. Sometimes though, when things get tough and the kids are complaining about every lesson plan, we start to doubt ourselves. With the vast array of books and resources available right at our keyboard, checking for the next latest and greatest curriculum looks like an easy solution to unmotivated kids. I believe looking to outward solutions is like building a house out of straw. The curriculum is just the outer shell of our homeschool. Before we choose one, we need to create a solid foundation and structure. Then curriculum can be added on later, like windows on a house. The best way to build a house is to start with a strong foundation and framework made out of steel beams. Identifying your unique Homeschool Lifestyle and creating a plan to consciously pursue it is like putting down a solid foundation and creating an inflexible framework around your children’s education. It is the plan and the structure that surrounds everything, giving it the shape you decide it should have based on your God-given vision for your individual children. Within that core framework a child can grow and flourish into the unique person they were created to be. The structure isn’t meant to constrict or mold the children, it is meant to protect, to guide, to act as parameters within which the child is free to grow and explore safely. It is much like designing a building. 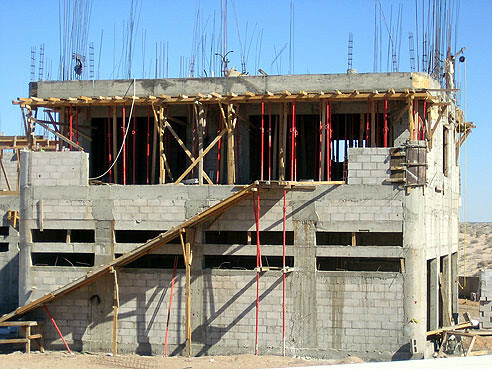 The basic shape and foundation is the same for almost all buildings. That structure works well and withstands storms. The doors, windows, colors and function of the buildings are different, but the core foundation is the same. With the shape in place, when you know exactly where you are headed and what the unique learning styles and personalities of your children need to nurture them into the people God created them to be, curriculum decisions become easy. Curriculum becomes a tool you choose and use based on knowing exactly what your goals are. Do you have ideas about what you want your homeschool lifestyle to be like, but no clue how to get there? Come ask me your questions on our Facebook page.